In veterinary utopia all of our patients jump out of the car, run through the front doors straight into the exam room, hop on the table and await excitedly for their poking and prodding. Unfortunately, the described behavior happens in only a handful of animals. Once arriving at the veterinary office, most patients try all forms of escape possible and when the doctor walks in the room, undoubtedly, they are hiding beneath the chair where the owner sits or in a corner, barking, hissing, spitting, and/or growling; making their disgust with being at the veterinary office very clear. The fact of the matter is animals are bombarded with a confusing abundance of smells, sounds, sights and textures that are overwhelming to them causing them to become overstimulated and consequently suffer fear, anxiety, and stress. Every visit confirms the fear they suffer causing subsequent visits to be more stressful and combative behavior to escalate. It's not their fault. They are confused and no matter how many times we tell them they are o.k and we are not here to hurt but rather help, they don't understand. They don't speak English. 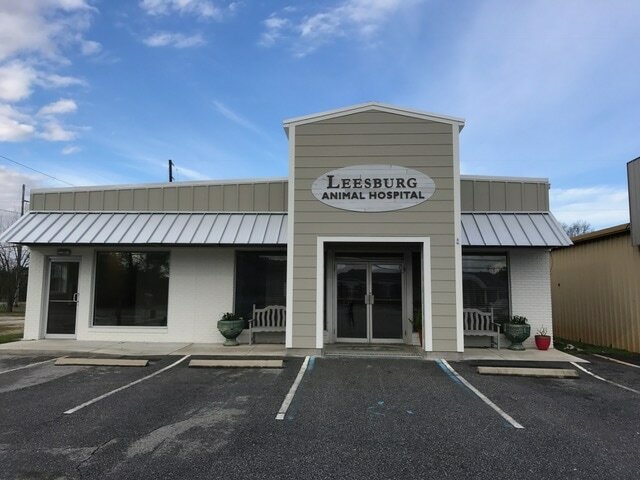 At Leesburg Animal Hospital, we have recognized this behavior in our patients and are taking major steps to address the culture of our hospital so that we can make the visit as enjoyable as possible. The doctors, as well as the staff at Leesburg Animal Hospital, have completed training to help us better understand the mindset of our patients. We feel if we understand the patient's point of view and from where their anxiety is coming, we can better understand the emotions they are feeling and hopefully communicate with them effectively. By doing so, we feel we can give excellent patient care through our techniques of compassionate approach and gentle control. We want every visit to be as safe and comfortable for our patients and our staff by reducing the fear, anxiety and stress of everyone. We encourage owners to communicate with us. We want to know the things that will make their pet comfortable. That may be things like bringing their bed from home to sleep on while boarding or their favorite food treats to feed during an exam. If owners feel their pets remain calm by waiting in a certain area, whether it be the exam room, the waiting room, or even the car, we want to accommodate those needs. We also offer what we call "pre-veterinary pharmaceuticals." Pre-veterinary pharmaceuticals are anxiolytic drugs prescribed to be given the night before and again a few hours before the veterinary visit to help reduce their stress level. Understanding that it may take a few visits to get our tools and techniques tweaked, we know we can make your pet more comfortable while at the veterinarian. 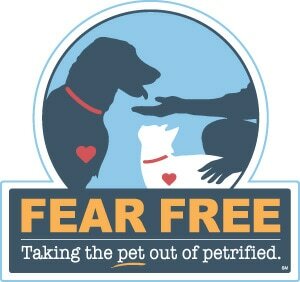 We invite you to visit fearfreepets.com. This website explains our training and certification and what our goals are by becoming Fear Free certified. Take a look; browse around and tell us what you think. If you like what you see, make an appointment with Leesburg Animal Hospital and see if your pet can benefit from our Fear Free techniques. ​People say cats are not smart...they don't know "sit." I completely disagree! It's true, you will most likely not take your cat on a walk; he will not ride in the back of the truck, play fetch, retrieve a bird, or perform a difficult agility course. What he will do is provide you with lots of love and companionship without asking for much in return. ​I'm a cat person. I admit it! There is no shame in my game! I don't think that makes me weird; it just makes me a cat person. 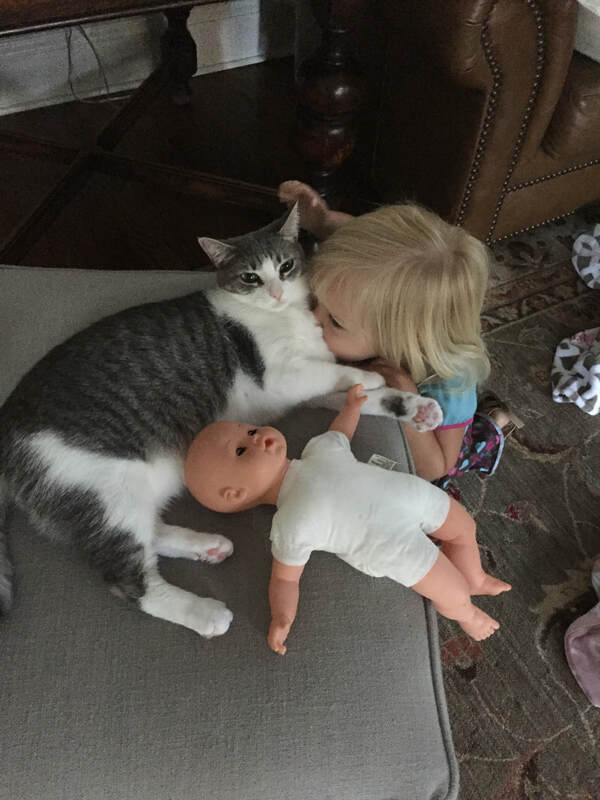 Cats have been a part of my life since I was a child, along with dogs, horses, cows, and the occasional calf in my living room on a cold winter night. I love animals, no doubt, but I am particularly fond of cats; I find them relaxing, entertaining, peculiar, interesting and just beautiful. I am not the crazy cat lady (Dr. Jennie has claimed that title), as only two cats reside at my home. However, if the hubs would let me, I would surely have more. Sadly he's not exactly a cat person, but he does do a good job of hiding his disdain for them. I don't know why, but cats are considered second rate pets in America. Only 23% of the patients on file at Leesburg Animal Hospital are cats. Leesburg Animal Hospital statistics show if a family has both a cat and a dog, the dog will visit the veterinary hospital twice as much as the cat. I talk to people all the time attempting to persuade them to adopt a cat. I am a cat defender; a mild cat activist, if you will. A year or so ago, a friend of mine, Julie, actually took my advice. 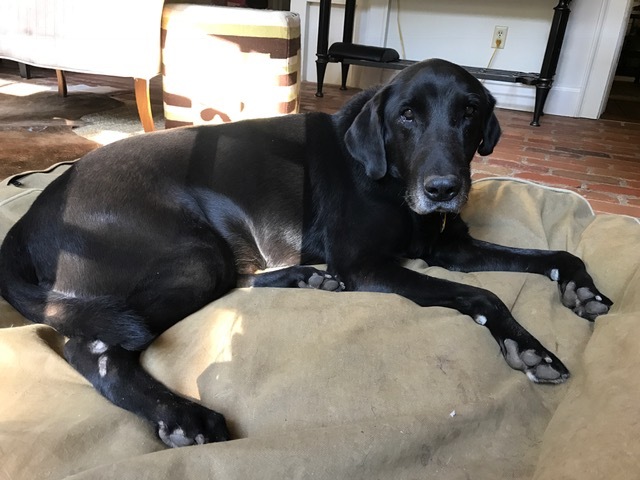 Julie and I were talking a few years after her beloved Lab passed; she expressed to me the house was lonely and she felt it was time to bring something furry and lovable into their home. We had talked on several occasions about cats as pets and she decided she and her husband, Paul, would visit the shelter just to "look." As she did not want to disappoint the girls if they returned empty handed, she did not even tell them she and Paul were going. On that visit Julie and Paul met a cute, friendly eight month old, kitten named Willow that just spoke to them. Within a few minutes of interacting Julie said she knew the kitten would be living at their house. In Julie's own words she says "she has been the best pet for our family for our stage of life. The girls adore her and she is so easy to care for! We can leave for the weekend and have family check in on her, but for the most part she takes care of herself. 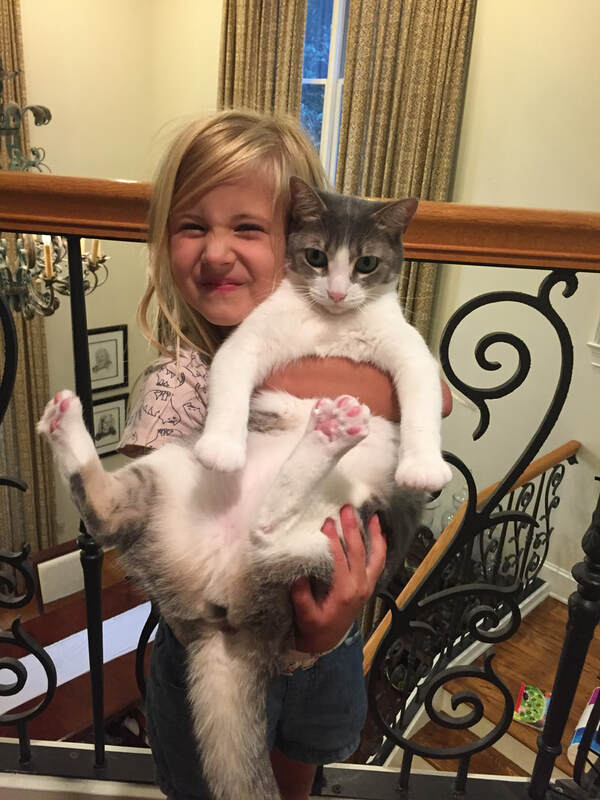 With three children to care for I needed an easy, simple pet, and Willow fits that bill!" To further drive home how wonderful cats are, I have come up with my list of top reasons cats make great pets. ​1. They are the perfect size. Not too big; not too small. The average cat is somewhere between 8-10 pounds and that is the perfect size for lap sitting or head snuggling at night. 2. Cats are easy to find. Cats are extremely prolific animals. They can have their first litter of kittens as early as six months of age and will have multiple litters of kittens in a year. Unlike dogs, cats can become pregnant again while nursing kittens. Routinely we have a group of kittens at Leesburg Animal Hospital needing a home and shelters are always overflowing with cats, so finding a cat is not a difficult task. 3. Cats are cheap! Annual visits to the vet are cheaper for a cat when compared to a dog. Feeding a cat, the largest expense of any animal, is much less costly than feeding a dog. Think about it; you could feed your eight pound cat the fanciest of all cat foods...one that is all natural, grain free, gluten free, made with organic fruits and vegetables, grass fed beef and free range chickens and will make your cat poop glitter, cheaper than you can feed your German Shepard the cheapest of cheap foods at the grocery store. Talk about a savings...can I get an "amen?" 4. Cats are low maintenance animals. "Independent" is the best adjective for a cat. Cat owners never have to hurry home to let their cat out. Like Julie, many cat owners will leave town for a long weekend and leave their cat(s) at home with plenty of food and water and an extra litter box. . Their independence makes them the perfect pet for apartment living, big city dwellers and workaholics. 5. Cats are resilient. I have seen cats live for 3 years with chronic renal failure or pancreatitis. They seem to have the ability to deal with their medical issues better than dogs. Cats are just tough. They have grit. 6. Cats have longevity. My oldest cat is approaching 17 years old. It's rare to see a dog live that long, and if you have, chances are he's not a large breed dog. I even have a few clients claim their cats are in their 20's. If you are considering adopting a pet. Please think about shopping at your local shelter. So many dogs, cats, puppies and kittens are in need of a loving home. An English Bulldog named Britches...gee, I wonder where his daddy went to school? I will give you one hint..."Go, you silver britches!" From the moment Britches snorts through our front door, we enjoy our time with him. He has a personality typical of most English Bulldogs; they are lovable, easy going, snorty, slobbery, wiggly and itchy...very, very itchy! There is no doubt about it...English Bulldogs are awesome...Britches is no exception, despite his pruritus. I speak the truth when I say I don't think I have ever met an English Bulldog that didn't constantly scratch. The only difference from one English Bulldog to another is the degree to which they scratch. Britches, as can be seen from the left side of the above picture (note the red face), is pretty pruritic. He was diagnosed a few weeks ago with a food allergy. Sometimes it is easy to diagnose a food allergy, with the clinical symptoms being very typical. Oftentimes the symptoms are more subtle and atypical making the diagnosis more difficult. Britches however, kind of read the food allergy book. 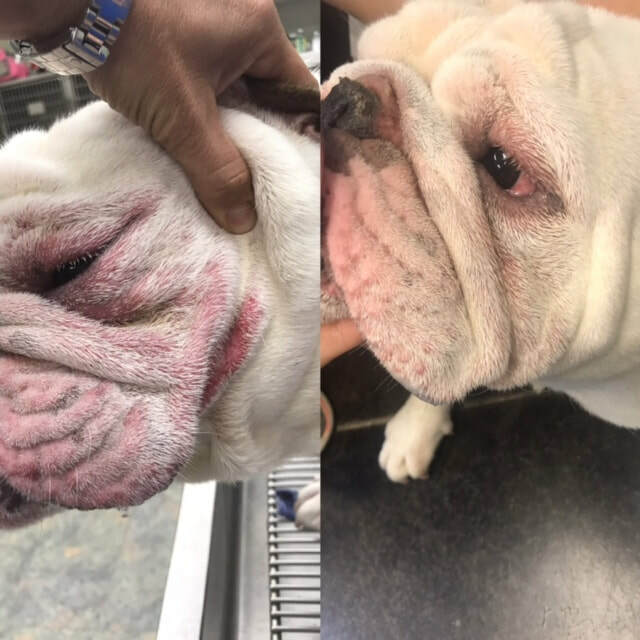 His symptoms of pododermatitis (inflammation of the skin on the feet), facial pruritis (an itchy face) and bilateral ear infections are common, which made the diagnosis easy. When a dog (or a cat) has a true food allergy the problem lies with the protein in the food. To treat a food allergy you have two options. 1. Use a diet with novel proteins such as venison, duck, or rabbit. 2. Use a hypoallergenic diet. Simply treating an animal symptomatically is never a good option. Not addressing the food allergy is sure to keep you going back to see your veterinarian. Once medication prescribed runs out, symptoms will return, most likely even in worse condition. Hypoallergenic diets address the root of the problem, the food. Britches was given option number 2 and put on a very strict diet of a food called Hills Prescription Diet z/d. Nothing else. No treats, no table scraps, no rawhides; he was instructed to eat nothing else but this dog food and water. Hills Prescription Diet z/d contains hydrolyzed animal proteins. The protein in the food goes through a hydrolysis process to break them down into pieces unrecognizable by the immune system. This technology uses the same concept that infant formulas such as Enfamil and Carnation Good Start use. These infant formulas are hydrolyzed milk proteins where as the z/d food is hydrolyzed animal proteins. . I ain't gonna lie; the food is expensive. It is the most expensive food on the shelf at Leesburg Animal Hospital. Whenever I give someone the price of it, they look at me like I have three heads and say "I can't afford that food." I try my best to make them understand they can't afford to not afford it. I explain they will actually save money by purchasing this food! It's true...let me break it down. Listen closely. You already have to feed your pet and you should feed them a good quality dog food. Subtract the cost of the good quality dog food from the cost of the z/d, and that is what technically it "cost" you. Now, take into consideration how many times you visit your vet a year for skin and ear issues and the money you spend. Remember, you are paying for a physical exam, any treatment in the exam room, plus medications to take home, not to mention loss of wages in time taken off work to visit the vet. When you compare the cost of the food against the cost of multiple veterinary visits, I am certain the food is the cheaper option. We have all heard the saying "you are what you eat!" Those are some very true words. In Britches's case, it like the Holy Word. If your pet currently looks like the left side of the above picture and you want him to look like the right side or you are concerned he or she may have a food allergy, call and make an appointment with any of the veterinarians at Leesburg Animal Hospital. We will start with a good physical exam and a hard look at the skin and go from there. We look forward to hearing from you! I am always the first person up in the morning before the sun rises. Asleep on a blanket in the kitchen, I could hear her soft, dainty snore before I could see her. It was a comforting noise that told me she was still here. It told me I had another day to touch the soft hair on the top of her head, to feel her wet nose on the back of my bare legs, and to look into those eyes full expression that begged me everyday to just stay close. ​In her younger days (and when I was not such a morning person) she was the dog that woke up when my alarm clock went off, always ready to take on the day. She would hear the alarm and immediately hit the floor pacing, her toenails tap dancing on the floor. When she realized I was not getting up after I snoozed the alarm she would settle down, only to pop up again when it went off a second, third or fourth time. Finally, after dragging myself out of the bed, she would bounce up and down as we walked to the back door; her jumps higher than my waist. I was so annoyed but yet so jealous of that early morning energy. ​I don't remember when that bounce to the door stopped. I do however remember when I began to carry her up and down the steps to go outside. She could probably still make it, but I hated to see her struggle. It hurt my feelings for her. She had always been such a tough, tomboyish little dog and somewhere along the last 2 years had gracefully entered into senior dog status. The Clark house has been a bit quiet these past weeks. It's been almost 15 years since I have been a one dog home. As most may remember we lost our lab back in mid May. Thirteen days later I made he tough decision to say goodbye to my Jack Russell, Ristra. Ristra was fourteen years old, weeks shy of her fifteenth birthday, August 4. In my post a few weeks ago about the home again microchip, she was actually gone. I haven't written about her death because every time I sat down at the computer I couldn't see the screen for the tears in my eyes, plus, I didn't want to write another sad story so soon after Ransom's. I have never been loved by a dog like I was loved like Ristra. Sure, all my dogs have loved me. By nature dogs are loving creatures. But this dog...this dog chose me. I was her person. She came from Santa Fe, New Mexico, hence her name. A "ristra," defined by Wikipedia, is an arrangement of drying chili peppers, that are used in cooking and are a common decorative design in New Mexico. While I was on a preceptorship there, I met this stellar little dog named Dixie. If I could have brought Dixie home with me, I would have, but unfortunately her owners were rather fond of her. Dixie was the typical JRT, a pit bull in a small dog's body. Her owners did, however, offer me one of her puppies. I gladly accepted. Ristra, also affectionately called Ri Ri, Reesie, and Reesie Peesie, came to live with me while I was on an internship in Texas. I had another Jack Russell at the time and to say they were fast friends would be a lie. It took a while for them to decide they liked each other but in the end they did. While in Texas I worked at an equine hospital that was an emergency and referral facility. It was a very busy hospital and required my getting up for many late night treatments (my house was 300 feet from the hospital). Ristra accompanied me on those middle of the night trips to the barn, protecting me from every frog that came out in the night. She was great company and immensely entertaining. She has been through almost 1/3 of my life with me...4 moves, a marriage, the death of two grandparents and three canine housemates and the birth of two children. Simply having her around has been a comfort to me. I still can't get used to the absence of that snore in the mornings. When I walk into the kitchen, I feel a bit of emptiness, something missing. What's missing is my little Ri Ri. I'm not sure when I will get another dog. I'm not quite ready to replace my two. To say replace is truly a misnomer; they will never be replaced. But we will one day open our hearts and home to another deserving soul. 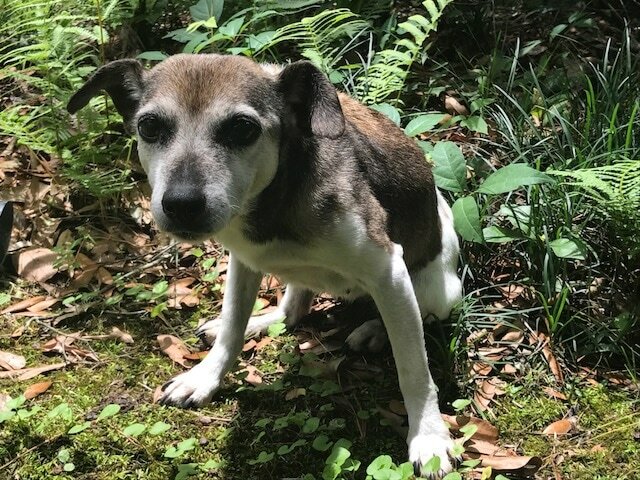 I recently had a client say to me, as they were in my same position making that final decision, their little rat terrier was a "small dog, large friend." I found that phrase befitting, so I stole it. That little fourteen pound dog had grit; she had soul; she had my heart. She may have been a "small" dog but she was "large" to me. Rest in peace my "small dog, large friend." The above picture is of a window and blinds that were mutilated by a dog suffering from severe noise aversion to the firing of a cannon. The culprit's name is Slate. Slate is a black Labrador Retriever and is owned by Maria who works here at Leesburg Animal Hospital. They live in Sylvester not far from the football field. At every home game, when the Worth County Rams score a touchdown, it is custom for them to fire a cannon in celebration. To say Slate hates the cannon is an understatement. He is mostly afraid of noises like fireworks, guns and the cannon but he also has an aversion to thunderstorms. During these events he moves into escape mode and his behavior becomes very destructive. The same night he destroyed the blinds in the picture, he broke two lamps and a picture frame and the furniture was covered in blood from the aluminum blinds cutting his gums and paw pads. 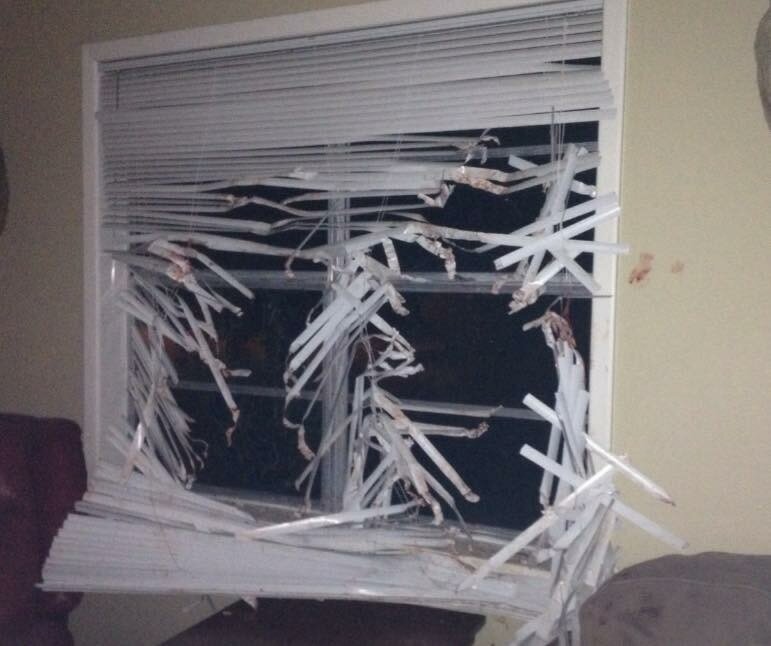 Some of the blood can be seen on the blinds and right hand side of the wall in the picture. Slate is not a bad dog. In fact he is very well behaved. He is your typical over zealous, friendly lab. He simply does not understand the noise of these events...where it is coming from, why it is happening and what it is going to do to him. Slate is certainly not alone. Fireworks are fun for humans, but unfortunately our animal family does not share the same affection for them. Personally, I love fireworks. They are exciting and I love to see the expression on my Wallace Anne's face. The loud booms excite her and the fireworks that make the whistling noise before shooting off their color give her a thrill thinking they are about to land right beside her. Celebrating our freedom truly deserves some fireworks in the beautiful colors of red, white, and blue, but the sad truth is animals are scared of them. The very noises Wallace Anne finds exciting make animals feel they need to flee for safety. Statistics show the busiest days for shelters is July 5th, further proving our animal family does not share our affection for this holiday. Preparing for such activities is paramount, and the "wait and see" approach is the worst choice one can make. If your pet has a history of noise aversion, just assume it will happen again; these things do not spontaneously resolve. Suggestions to helping your furry friend make it through the event are to create a safe place. If your pet has a room, a favorite bed or a crate they find comforting, that oftentimes may be the only thing they need. Other ways to help relieve anxiety are drowning out the noise with television or calming music, using FDA approved pheromones such as Feliway or Adaptil, and anxiety wraps such as Thundershirts. For animals more severely affected by the noise, it may be necessary to medicate them. Medicating the pet before the stressful event is key as it is much easier to prevent an animal from getting excited than it is to calm one who is already upset. Oftentimes, removing the animals from the situation by boarding them at a boarding facility may be the best option. However, if nothing has seemed to help, a new option is available. It is called Sileo (Latin for "be silent). Sileo is the only FDA approved drug for treatment of noise aversion in dogs. Sileo is a transmucosal gel administered 30-60 minutes before the stressful event and continued as needed up to every 2 hours but not to be given more than 5 times in a 24 hour period. If your veterinarian has already formed a treatment plan for your pet's noise aversion and he responded well, I suggest you stay the course. But if you think Sileo may be an option for you, make an appointment for a consultation with your veterinarian. Please keep in mind Sileo is not an OTC drug and a good client-patient relationship must exist before your veterinarian will prescribe this medication. Sileo does not come without warnings therefore a thorough physical exam to evaluate the cardiopulmonary system and blood work to evaluate the liver and kidneys may be suggested by your veterinarian. Everyone at Leesburg Animal Hospital hopes you have a happy and safe Independence Day. Slate would like to remind everyone to make sure their pets have on proper identification, a collar with an ID tag and a Home Again Microchip. And all the girls at Leesburg Animal Hospital would like to remind everyone to not drink and drive and let freedom ring (or bark and meow)! While I was in vet school I had a little Jack Russell Terrier named Sage. It was just two of us living together in this tiny little house. Because I spent many hours sitting on my rump studying, she spent many hours attached to my rump. I had a large, comfortable recliner where she and I would sit nestled together into the wee wee hours of the night, turning pages of text books and class notes, reading and reading and reading. Throughout these hours I would get up for various reasons...a potty break, a snack break, a break to make a phone call, etc., etc. She would just lay there, chin sitting on top of her front paws, brown eyes following my every move. But somehow, when I would get up for the final time, she knew. She would pop out of that recliner with the energy of a puppy, ready to follow me up the stairs and into the bed. I never could pin point exactly what it was I did that signaled to her it was bedtime but some how she knew. She knew me better than anyone else, probably better than my own mother knew me...better than I knew myself. I tell this story simply to illustrate how adept dogs are at reading people. They know our routines and habits and can pick up on the smallest of details, as evidenced how Sage always knew the difference in my getting up to fix a drink and getting up to go to bed. By the same token, you may not realize how, when it comes to medicating your dog, you are setting yourself up for failure simply because your dog knows you too well. Through my fifteen years of counseling folks on how to get that little pill into the mouth, down the esophagus and into the stomach where it can work its magic, I have come up with some pointers and would like to share them with you all in hopes the next time you are pilling your pooch, maybe it will be a little more thrilling. 1. Offer pills when the pet is hungry. Covering the pills in something a bit more tasty and disguising them as a treat increases the odds for success. I suggest things like pill pockets, lunch meats, squirt cheese, peanut butter, hot dogs, or maybe even hiding them in some canned food-the smellier the better! 2. Taking into account the dog can smell, as my daddy says, "a gnat fart," he can also smell the pill residue on the outside of the treat. Trust me, the nose knows! When wrapping your pill in a treat, use what I call the clean hand/stinky hand technique. Use one hand for touching the pill (stinky hand) and the other hand for touching the treat (clean hand). Never let the stinky hand touch the treat, especially the outside of it. 3. Get the pill ready before you are in front of the dog. Dogs will pick up on the sound of the packaging or the sound of the pills moving inside the pill bottle as you shake them out. These noises signal them what is about to happen and could be setting you up for failure. 4. Use your happy voice. Whatever you do, do not ask your dog if he is ready for his medicine or apologize to him for what you are about to do. Not because he understands what you are saying but, undoubtedly, you will speak to him in a voice of doom. He will pick up on your tone of voice, your slumped shoulders, your hesitation, your change in movements, which tell him something bad is about to happen. Use the same voice you would use when you ask him if he wants to go for a ride or go for a walk, or just ask him if he wants a treat. 5. Don't immediately give your pet the medication. Have the pill ready, disguised as a treat. Give him several real treats in a row. When you feel he is pretty excited about the treats and readily eating them without any scrutiny, drop the bomb and hopefully he will never even know. This may take two or three treats before hand or it may take ten or twelve. 6. Don't be predictable. If you keep the dog pills by the kitchen sink with all the other medications, he may eventually pick up on your routine. Take advantage of the dog that begs from the table. Use the same tactics as above, but have the pill sitting beside your plate, and pretend like you are feeding him a table scrap. Alternatively, if you always give your dog a treat after he does his business outside, have the pill disguised in a treat then. Giving the dog a pill when he least expects it, is your best bet. 7. If you have to resort to "pill pushing," (shoving pills down the pet's throat) always follow up with a positive event. Praising, petting, and extra treat giving is always helpful so that hopefully the pet will eventually associate taking medication with something positive and become conditioned to like it, or at least not run from you. Be sure to follow up with a little bit of water so that the pill is not sitting in the esophagus. 8. Many medications come flavored. When available these medications must be ordered from a specialty pharmacy and will come with an added expense, but if they are the only thing that gets your pet to take his medication without a fight, it certainly is worth the added cost. If you are one of those owners that have a particularly difficult pet to pill, you are not alone. 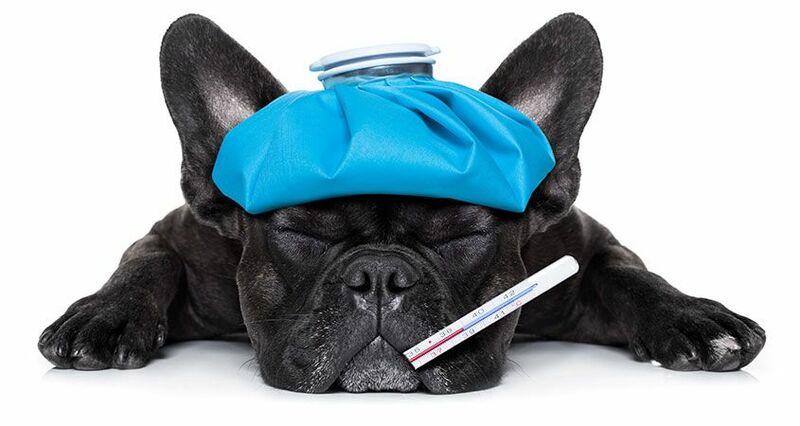 Medicating your pet can be frustrating and can put a strain on the human-animal bond. Everyone at Leesburg Animal Hospital has resorted to trickery and bribery to get their own animals, as well as patients, to take their pill. So if you try the techniques above to no avail, do not hesitate to call on us for advice. It is what we are here for. We are professional pill poppers! Yep, that's a picture of my husband and my old dog, Ristra, at the Albany Humane Society. Why exactly are they at the shelter you ask? Excellent question! I wish I could say they were there doing some volunteer work, visiting the lonely animals, or maybe even adopting another needy puppy, but I can't. I have to tell the truth. Ristra was picked up in the St. Andrews subdivision and turned in to the shelter by a good Samaritan. We live on Old Dawson Road and, from what I can piece together, she left the yard and traveled to West Alberson, by way of the neighbor's yard. At fourteen, the mere fact that she walked that far is impressive. How did this happen you ask? Another great question! Again, honesty is the best policy. Ristra did not have on her collar. The truth is, she really hasn't worn her collar for quite some time because she just hangs out at the back door until someone lets her in. I know... I should be publicly shamed. I should be forced to wear a sign around my neck that reads "I'm a vet and my dog got turned into the shelter," It should be posted all over social media so everyone can poke their finger at me and say "shame on you; practice what you preach." In recognition of National Microchip month, which is June, I wanted to write this blog and tell of this slightly embarrassing situation. I mean come on...no one really expects the veterinarian's dog to be impounded...locked up...mug shot and all!! It's kind of like the preacher's kid getting caught smoking in the locker room! Not good for the family image! But this vet's dog did! Yep, she has a record...animal at large. This all went down a little over a month ago. It was late afternoon and I was at dance recital practice with Wallace Anne when I got the phone call from the shelter. Fortunately, they had scanned her and found her Home Again Microchip. The shelter was about to close and all employees were leaving for the annual fundraiser, Bark At the Moon. Thankfully, some kind soul hung around so that my husband could pick her up. I can't express how important it is to have two forms of identification on your pet. The collar with an i.d tag will get your pet returned sooner but oftentimes collars become lost. The microchip is kind of the back up plan. Although you know your pet well, their behavior and their routines, you never know when they may get brave and decide to do something out of character...like hit the road. It's your responsibility to make sure they have identification. Many different brands of microchips exist, but at Leesburg Animal Hospital we use the Home Again brand. It is a device the size of a grain of rice which is placed between the shoulder blades with a large gauge needle. Many owners elect to have it placed while the pet is under anesthesia during a routine spay, neuter or dental procedure. Anesthesia is not necessary, however. When the lost and found pet is taken into a veterinary office or a shelter, as standard operating procedure, the pet is scanned. If they have a microchip, a number unique to them comes up on the scanner. The chip company is called and given the number so that the owner's contact information can be released. That is exactly what happened in our situation. We were notified just a few minutes after our old girl was found and 30 minutes later she was back, safe at home. The truth is, it can happen to anyone; animals are lost daily. But when it happens to your own pet, you will wish you had taken the extra precaution. The Home Again Microchip is easy, safe for the pet, and very affordable. 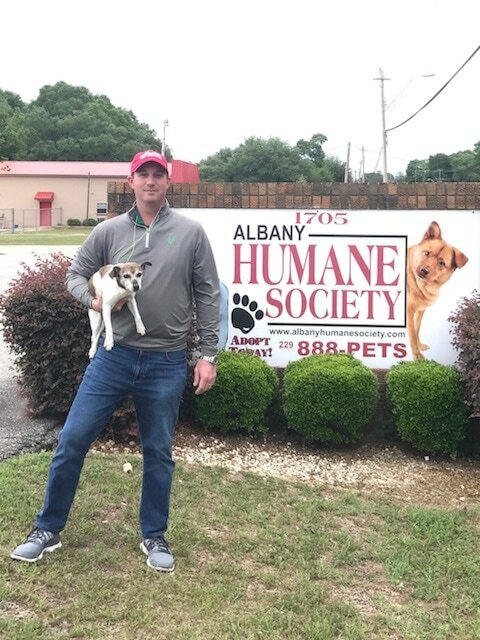 If you are interested in learning more about the Home Again Microchip, we would be happy to answer any questions at Leesburg Animal Hospital, just give us a call. 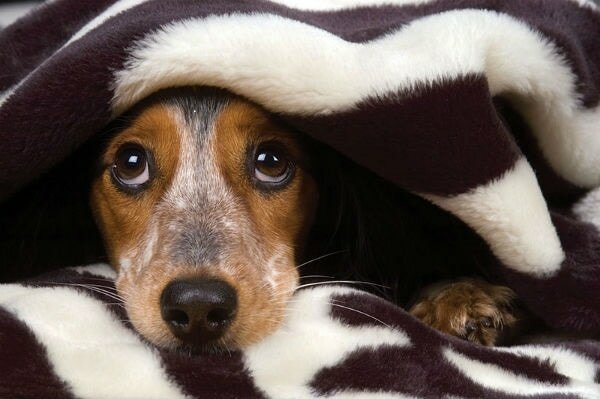 Noise aversion, defined as a phobia to loud noises, is a common issue in pets and unfortunately one that is not addressed because it is looked upon more as a frustrating behavioral issue rather than a medical issue. Most owners never seek treatment for noise aversion unless the clinical symptoms progress and become intolerable. Oftentimes, if treatment has been sought by an owner it has been inadequate or completely ineffective. If noise aversion becomes severe enough it may impact the human-animal bond and owners will elect to place the animal in a shelter or even euthanize. Common triggers for noise aversion are fireworks, thunderstorms, gun shots, a loud, unfamiliar house guest, shrieking children, parties and celebrations, construction work, traffic and other types of street noise. It is important to recognize that these animals are suffering from severe fear and anxiety and are stressed. With a little pharmacological help pets can be more comfortable, and if combined with behavioral modification techniques, can learn to better cope with noises and live a happier life with less fear, anxiety, and stress. Some common symptoms of noise aversion are trembling, shaking, cowering and clinging to the owner. Other obvious symptoms are darting from hiding place to hiding place, trying to escape or destroying property while other animals may pace, whine or whimper. More subtle signs of noise aversion, which may go unrecognized, are pinning the ears back, yawing and licking lips, excessive panting and hyper vigilance. Why noise aversion develops is not completely understood. It is most likely the result of several problems from lack of socialization/desensitization to genetic predispositions. No matter what the reason for the development of noise aversion it is an issue that needs to be treated. Positive outcomes are frequently compromised by delaying any treatment until the signs of the dog’s distress are more profound or its behavioral responses become problematic to the owner. Such delays can lead to an increase in the intensity and duration of the response to the noise, to the development of noise aversion to other sounds or to the development of other anxiety disorders, further exacerbating the dog’s condition. If you think your pet is suffering from noise aversion, no matter what the reason, talk with your veterinarian about treatment options. No animal's fear, anxiety, and stress are the same and each treatment plan will be different. It may take several different attempts at drug combinations paired with consistent desensitization and counter conditioning techniques. Owners need to be prepared to have patience and realize this is not a problem that developed over night and therefore will not be quickly solved with a simple pill. If you are concerned that your pet may be suffering from noise aversion we would love to talk with you at Leesburg Animal Hospital and hopefully help you and your pet live a more comfortable, stress free life together. Our house has been a little more quiet this past week. Sadly, we lost our lab a week ago today. It has been sad but at the same time I have bit of peace about me. I no longer have to question when is the time to say goodbye. I no longer hear him coughing or gagging in the night and randomly pacing. I don't have to see him struggle to get up and down the steps or in and out of my truck. I no longer wonder if he is happy or wishing he could tell me to just let go. He is gone. If dogs really do go to heaven, I know right where he is. He is sitting on God's back porch chewing up a very large stick or rolling in something dead in his back yard. Losing a pet is so very hard, no matter how long you have had them. Ransom was 14. We had him for 10 of those 14 years. He came to us through a plantation. One of the plantations we did work for pointed him out to my dad and said he needed a home. They claimed he did not fit into their type of work and he just lived in the kennel. He was well taken care of but they wanted him to have a better life. Enter Charles and Haley. My dad brought him home for Charles (because no boyfriend of a veterinarian should be dog-less)! We quickly realized why he did not fit into plantation life. Ransom was the goofiest, clumsiest, and most hyper lab. At this plantation they hunted off of wagons and apparently he would jump of the wagon. I think Ransom had some type of anxiety about riding in or on something moving because that trait became aware to me while riding in the car. He hated car rides. He would ride in my back seat on the driver's side and pant the whole way to work into the back of my head, my hair blowing with every breath. Sometimes I had to ride with the windows down to deal with that hot breath and stinking body for my 17 minute drive to work. When I get to know an animal, I attribute some type of human personality to it. I think "if this animal were a person, what would he be like?" If Ransom were a human, he would be a funny guy...the type of person that always made you laugh, not an over the top kind of class clown, just a naturally funny kind of guy who could easily laugh at himself. He would also be very sensitive and have the right words to say to someone when they were sad or down and out. I think all the girls would have wanted a date with him and he would most definitely have been voted "Most Likable" when he was a Senior in high school. He just would have been the guy everybody liked...a good ol' boy. 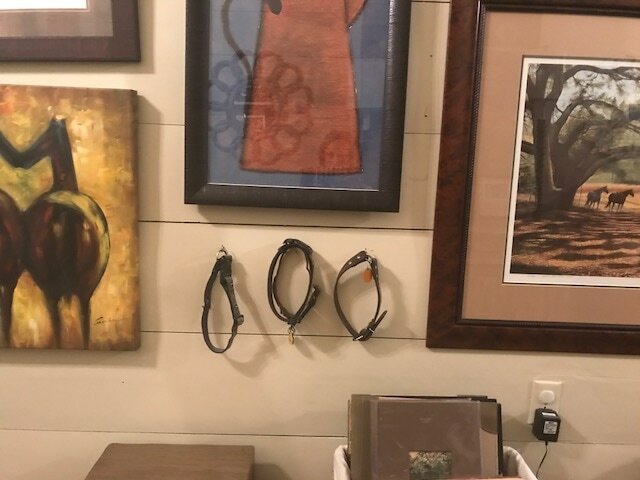 Since Charles and I have been together, we have combined the collars of our deceased animals and they hang in a picture gallery in our hallway (that is the picture above). For most of our time together we have only had three collars hanging there. Now there are four; two collars hang on that middle hook. It may be a morbid way of thinking but I know that number will increase. Having pets is a beauty and a beast. The beast is they leave much too soon but the beauty is the joy they bring. I simply can not imagine a life without them. It is funny sometimes, how the things I am afraid to do turn out to have the most positive response. Last week when I wrote my blog about Ransom, I was not sure whether or not I wanted to put myself out there and be vulnerable by telling Ransom's story. I was scared for two reasons. First, I talked about euthanasia and I know many people are strongly against it. By sharing my view on it, I was afraid I might offend some people. Secondly, I was afraid I may show too much emotion. As a veterinarian, I don't ever want to appear harsh or that I don't care, but at the same time I can't let myself give into my raw emotions and appear unstable or effusive. I have to keep myself somewhat disssociated in order to make the best decisions for the animal, but connected enough to understand the needs of the pet's people. It's a fine line we veterinarians walk. Much to my surprise, I had a great response. I have had an abundance of people send me blog messages, Facebook messages, emails, texts, and even a few phone calls expressing their concern. Everyone who comes in the office asks about Ransom. It is nice to know people care. Truthfully, it is a beacon of hope during this election time filled with so much disdain and intolerance for others. My heart has been warmed. I thank you all also, for sharing your memories of your own pets, your struggles with their last days, what they meant to you and how you honored them. Whether I am your veterinarian or not (and if I am not, that is ok), we all have a common bond in that we love our animals. They provide us with something, whether it is friendship, entertainment, protection, or just a little warmth at night in a lonely bed. They enrich our lives in countless ways. I am happy to report Ransom is doing much better than I expected. He is not 100% and I don't think he ever will be, but I still feel like he has a good quality of life. I treated him for vestibular disease and changed up his arthritis management. To say the least, I am happy with his improvement. I know full well, the prayers he received over this past week helped him. And you all must have prayed for me too, because I feel revived. I'm not sure how, but some people do not believe in prayer. I respect that and will not try to preach the word, but I do know one thing for sure...prayer never hurt anyone! So, I say keep 'em coming! And as my four year old says at the end of the blessing, "Amen to Jesus!" 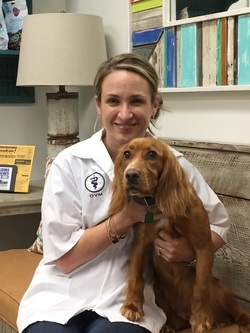 Dr. Haley Hydrick Clark graduated from the University of Georgia in 1998 with a degree in Animal Science and from Tuskegee University in 2002 with a degree in Veterinary Medicine. After graduation, Dr. Clark completed a one year internship at Performance Equine Associates, a full surgical, reproductive, and intensive care.